Diabetic shoes and specially made diabetic foot orthoses are critical to proper management of a diabetic foot. Proper diabetic foot care reduces the risk of ulceration and amputation. Diabetic foot orthoses help reduce friction, disperse pressures more evenly over the foot, offload necessary areas of ulceration, and properly align feet and ankles. Proper diabetic foot care reduces risk of ulceration and amputation. Diabetic shoes provide extra width and depth, reduced seams on the inside of shoes, and are made of fabrics that are stretchable/ breathable. 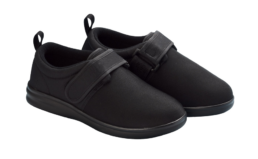 These shoes provide the room for custom diabetic foot orthoses to fit properly. What styles of shoes are there? We have many styles and brands available including Dr. Comfort, Anodyne, Apis, Mt. Emey, and more. Check out some of our partners below. I am a diabetic with circulation issues in my feet. I found myself in need of specialized foot care and was referred to Limbionics by a Podiatrist. I was delighted to receive services from someone as personable, compassionate and knowledgeable as Brittany. She is an excellent clinician. She took the time to thoroughly evaluate my needs and formulate an excellent care plan. I am grateful for her expertise and I look forward to continuing my care in such competent hands. Not sure what your insurance will cover or which diabetic shoe you need? Find out with your free consultation. Schedule your consultation today. Find out with your free consultation.